New York City will definitely not be having a White Christmas, but when winter finally does arrive, sanitation trucks will be hauling some of the city’s snow-melting salt out of this quite beautiful sculpture. Turns out this is also an incredible story about how city buildings can be done right. The project took nearly a decade and cost a king’s ransom. Luxury apartment developers in the neighborhood predicted Armageddon. Instead, apartment prices went through the roof. The garage and shed have ended up being not just two of the best examples of new public architecture in the city but a boon to the neighborhood, whether the wealthy neighbors have come around to it or not. I can’t think of a better public sculpture to land in New York than the shed. Although the finished building is so nice you might confuse it for a new museum, it’s very easy to see why the affluent had a knee-jerk NIMBY response to the project. The stats sound like something you definitely wouldn’t want to live near: Storage for 5,000 tons of salt, plus three garages to clean and repair the 150 trucks that would spread it in the event of a snowstorm. But it turned out the residents had nothing to fear once the building was in the hands of architects at Dattner Architects and WXY, plus two city clients that have actually proven themselves to have quite good taste, the NYC Department of Sanitation and NYC Department of Design & Construction. Sound from the garages was the first issue, which has been diffused by 2,600 metal panels that surround the complex. These light up at night, giving the building a warm glow. In fact, all over the building are quirky reminders that the building is part of “DSNY”—kind of like your friendly neighborhood sanitation department. In all seriousness, you might also think this is a corporate campus for a tech company. But the salt shed itself is kind of a marvel. 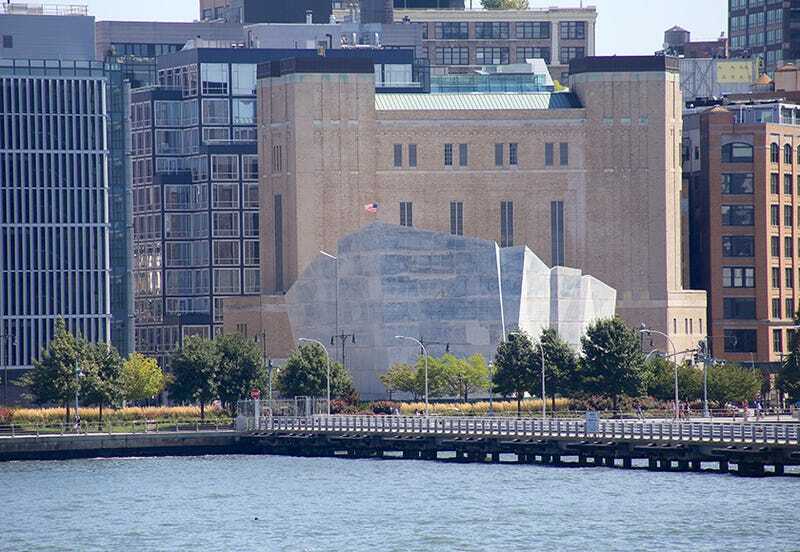 The 70-foot tall concrete structure is designed in the shape of an actual salt crystal. It’s pretty much a piece of sculpture, with dramatic angles that catch the sun like some kind of scenic sodium chloride canyon. As Kimmelman mentions in his review, this shows that great architecture can happen when neighbors are engaged in the planning process—as they should be!—but it’s also proof that all of us should not accept anything less than greatness when it comes to the public buildings around us. Let’s hope that cities might start to take the same approach to infrastructure. There’s no reason a freeway overpass can’t be a similarly breathtaking piece of public art.